Why I Read It: I love travel books! This is one of my favorite books to look through. Whenever the travel bug bites I either watch one of Samantha Brown's shows on the Travel Channel or I pick this book up and the travel bug (temporarily) goes away. As much as I love to travel and see new places my bank account does not always agree! Actually, it rarely agrees. But this book helps keep me sane! This book is amazing. Seriously. Lonely Planet takes you on an adventure, an adventure that goes through 230 countries (in alphabetical order). Each country gets two pages in the book. One page is just pictures, and the other is facts about the country. This book is informative, but please don't read this if you want to learn every little thing about Peru or what hostels to stay in when you travel to France. 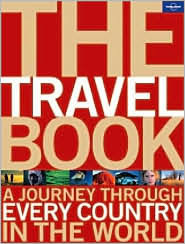 The Travel Book just gives a general overview (with gorgeous pictures). This is a great resource to be able to get a sense of all of the countries in the world. One each country's page it follows the same format: There is a small blurb about the country followed by: The best time to visit, Essential experiences (things you must do! ), Getting under the skin (what to read, listen to, eat and drink to get a better feel of the country), In a word (a word of phrase that sums up the country/language), Trademarks, Surprises, and there is always a small map of the country at the end of the page. Plus the country's capital, population, and official language are also given. This book may be a little outdated in some aspects, as it was published five years ago but it is still a fantastic read. You can travel the whole world just by lounging on the couch. I think it makes a great coffee table book. Sounds like I will have to be picking this one up since I have been bitten by the eternal travel bug. I have a plethora of travelogues/travel books on my shelf so this one sounds like it will be a nice addition to the collection. This sounds like an awesome resource. Not something that one would read leisurely but defintely good for a start. I want this book now. Jamie: This book would make a great addition to your collection of travel books. Sam: I glad you enjoy this book! Julia: It's not really a leisure read but once you put the book up it's hard to put back down. May I suggest, if you have not read it yet: 1000 places to see before you die by Patricia Schultz. It's incredible. I love this book. I also have checked out from the library the individual books for Europe and Asia and Africa. All very cool.